Hello again crafters, I back to share another watercolor card. 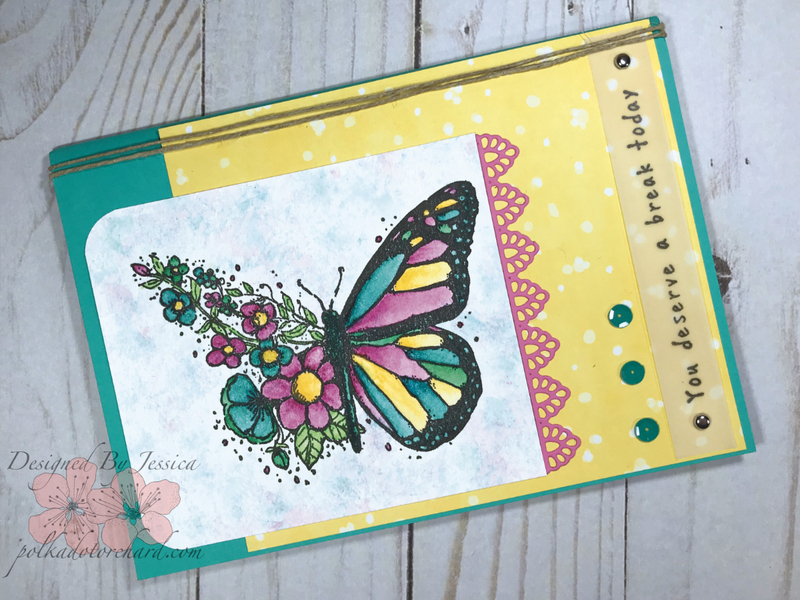 Isn’t this butterfly beautiful, Unity Stamp Co. did a great job with this stamp. I watercolored this butterfly using Mission Gold watercolor on Canson 90lb watercolor paper. If you do a wet on dry painting, the cheap lighter weight paper works just fine for card making. Anyways, Mission Gold makes some wonderfully smooth bright watercolors, and I have really enjoyed playing with them. This beautiful butterfly is from Unity’s December 2017 KOM called “Start Of Something New”. While I was painting it and almost done I made a bit of a boo-boo. *Note to self ~ Be more careful (I’m forever making mistakes that I have to fix). I smudge some of the paint onto the background, not wanting to start over I had to think of a creative way to fix it. So, I decided on a technique I came up with that for today I will call it the “Paper Towel Smush”. To do this technique crumble up a damp paper towel and lightly dab it into diluted watercolor then lightly dab it onto the background. Make sure the first color is dry before adding the next color. Easy peasy, right? Make sure to give it a try. After I was done painting my image I used my corner chomp to round the corners on one side and leaving the other side completely straight. I then layered it on my card base by attaching it to some yellow pattern paper. 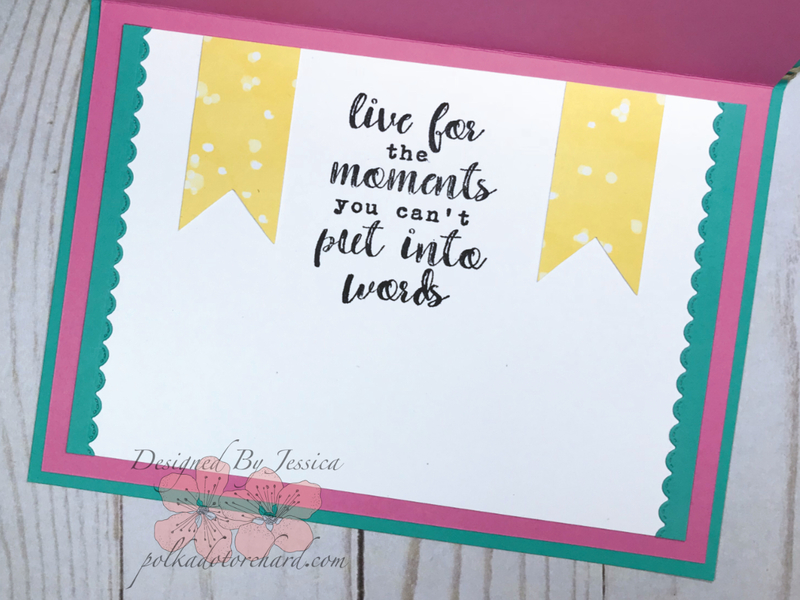 I then used a pretty border die to cut come some pink cardstock. After running my die cut paper through my Xyron sticker maker I very carefully lined it up with the straight edge of my painted image. The sentiment “You deserve a break today” is from Unity’s “Start Of Something New” KOM, which was stamped onto a strip of vellum with Stazon ink then attached to the card with some metal brads. I finished up the front by double wrapping some light tan jute twine around the top and added a few turquoise sequins. Of course I had to do the inside as well making sure it match the front of the card. To do this I used the lawn fawn scalloped border die to cut some trim which was attached to the left and right of the sentiment. I then cut two banners with the same pattern paper that was used on the front of a card also attaching it to the left and right of the sentiment. Doing simple things like that with coordinating papers used on the front tie everything in an easy way. Oh yeah, the sentiment, isn’t it nice? “live for the moments you can’t put into words.” Is another Unity stamp, which is from the same Unity KOm “Start Of Something New”. We all deserve a break every now and then, even though a lot of us don’t get those brakes we need. So please tell me if you were to get a break what would you do during that break? I hope today’s post has inspired you to take a break and create something crafty. Come back soon and have a great day. A beautiful card. You colored/painted the butterfly pergecper. Such a wonderful butterfly. I like the layers and that you crafted the inside of the card. Very nice work. What a beautiful Butterfly! I love the colors & Layering! So Pretty!